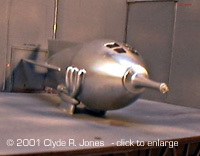 Clyde Jones builds Ming the Merciless' Rocketship. 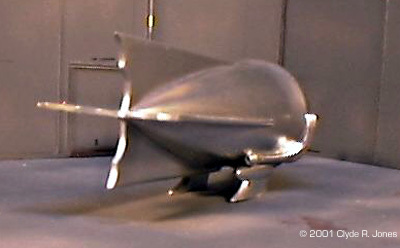 Molding Quality: 8 - the fins are wonderfully sharp and straight, with only a small bubble on one fin tip. There are bubbles around the pour area of the main body, some rather large. Detail: 9 - The only real ‘detail’ is the doorway, and it’s fairly well done. 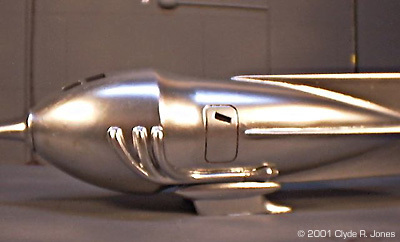 Accuracy: 9.5 - This is an excellent model of the Evil Emperor’s Rocketship from the first Flash Gordon serial. Later serials showed more windows, and finally another door appeared on the ship’s right side. Fit: 9 - This kit almost assembled itself in the box, without shaking. Ease: 8 - This is a fine rainy weekend kit. Once you can get the @#^*&* primed. Overall Rating: Wonderful rendition of a truly classic ‘30’s spaceship. Also, the only one on the market of this particular design. I loved the early Flash Gordon serials presented in living Black and White each Saturday morning on T.V. Never having seen them in a theater, they seemed quite nice on a relatively small B&W screen, and to a kid, lots of fun. I still watch them occasionally, now that DVD's are out of all 3 serials. Hokey by today's standards, yes, but still fun. ^ Top/rear The ship 'designed' by Dr. Zarkov had odd 'canards' sticking out the sides of the front 'acorn', and I liked that design. But my favorite ship was always the rocket(s) used by Evil Emperor Ming the Merciless. Sleeker, less 'clunky', no giant wheel fairings hanging below the ship, just 'cooler'. Even if the ships did dribble sparks and smoke in a very odd way, and their 'disintegrator' beams looked a lot like roman candle charges, they were very neat. Herb Deeks has released two kits that I know of from the 1930’s serials - Flash’s ship (well, Dr. Zarkov’s....) and Ming’s. I purchased the Evil Emperor’s Rocketship from Sci-Fi Matters a few years ago, and built it up last year. It seemed simple enough - enlarge the gaping hole in the front of the big, solid, heavy resin body, stuff in the ‘nose cannon’, slip the two landing pods/skids into their oval recesses, and then stick the ‘acorn bits’ on the ends of the ‘lake pipes’ coming out of the fuselage. And it was. Everything fit wonderfully. The 'cannon' forming the nose was even reinforced with a wire down the middle for strength. And, maybe, to keep the more enterprising of us from trying to make it 'work'! Then there were the bubbles. Herb apparently fills the mold for the main body from the very front. That’s where all the bubbles accumulated, some up to 1/8 inch diameter, usually around the window openings. THAT took some filling and sanding. There was also some unevenness along the parting lines of the mold and along the top and bottom fin, but nothing excessive. Herb did a very good cleanup of the castings before shipping them out. No pour stubs to remove even. But I wish he’d used pressure casting to eliminate those pesky bubbles. It went together easily, sanded well, and paint.... well.... Have you ever tried to spray paint a bar of wet soap? Doesn’t work well. Most of the well sanded, thoroughly cleaned surface took paint just fine. Several large spots rejected just about everything I and my crazed hobby- shop-owning Biker buddy threw at it. Including some very ‘hot’ primer he used. Sanding didn’t help. Cleaning with everything from dish detergent, to harsh solvents didn’t help. I finally began hitting it with layers of Krylon gray primer, letting that dry, sanding, and painting again. Eventually, the spots gave up being recalcitrant and took paint. Eventually. 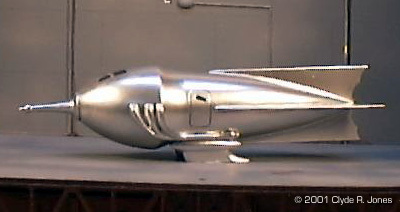 It also took several tries to get an even layer of Plastikote Chrome on the model. Plastikote sticks to almost anything. This was a challenge even for it. Lastly I painted the windows shiny black, and accented the door lines with a fine tip H pencil. But, finally, the ship came out chrome. Nice and shiny, like it had just been polished and hot waxed by Ming’s cringing minions. No, I didn’t sand out every little blemish and blot of paint for a ‘perfect’ finish. I was wearing out by the time I got it to accept an even coat of chrome. But from a few feet away, it’s just what I’ve wanted for a very long time. A fine model of Emperor Ming’s sleek, deadly, spark-dribbling, roman-candle-shooting, Rocketship! Thanks to my wallet for this fine review sample. This page copyright © 2001 Starship Modeler. Last updated on 24 November 2001.